L'Anza understand that healing is truly the foundation for beautiful hair. Their professional hair care products offer revolutionary formulations to specifically to heal the hair combining natural ingredients with the most advanced ingredients science can offer. The new L'Anza Healing Oil has a powerful blend of Keratin Protein and Phyto IV Complex which restores and heals severely stressed and excessively damaged hair. The Healing Oil absorbs rapidly and completely, leaving your hair incredibly healthy with a radiant shine. It also contains triple UV and maximum thermal protection. Using the oil reduces drying time and boosts the strength and elasticity of your hair. It is suitable for all hair types and gives your hair a velvety-soft and silky-smooth finish. 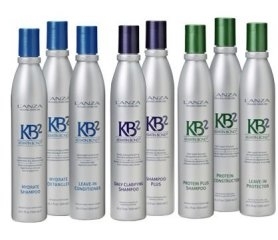 L‘Anza’s new Keratin Bond Systems 2 complex uses Keratin protein to heal and strengthen hair from root to tip. Blends of Organic botanicals and antioxidant vitamins leave the hair shiny and soft. Heals to give strong radiant hair.